Soccer fans, start the free download of the Forza Football iPhone, iPod Touch, and iPad app from the iTunes App Store. Yes, it is that awesome. As it downloads, read this review to introduce you to its great features and interface. 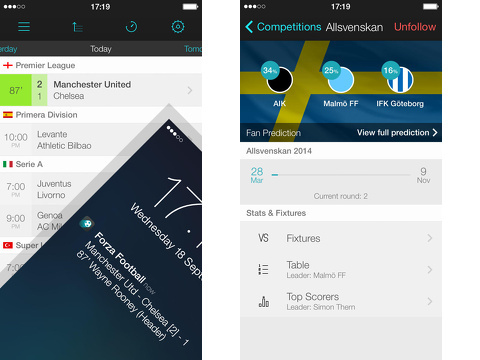 The Forza Football iPhone app begins with a lengthy step-by-step process to identify your favorite local, national, and international soccer preferences. The first screen identifies the leagues available in your country, so for US residents, you touch to select MLS, NASL, and/or NWSL. Then, you choose your favorite leagues from a thorough list of the most competitive international leagues including BPL. The third screen gives you a chance to identify your favorite international competitions like UEFA, Copa, Olympics, World Cup, World Cup Qualifiers, International Friendlies, and more. You select your favorite local teams. Then, there is a list of popular teams like Manchester United, Real Madrid, and Juventus. Finally, you select notifications. The home screen of the Forza Football app includes the matches that reflect your preferences. You swipe horizontally between Yesterday, Today, Tomorrow, and Upcoming to see each day’s list. You tap on a match to access match details. The match detail screen is wicked. You can follow the action play by play. Significant events in the game are designated with the time the action occurs on a vertical line graph. You can also scroll horizontally between the table, game statistics, lineups, and additional media. You can vote for who you think will win and the best player of each game. Another interesting match detail is the history of the rivalry, the location, coaches, and specialized info like aggregated scores. In the upper left corner of the home screen, a sliding menu allows you to move between categories like matches, competitions, team, and settings. The competition interface provides a list of competitions. A touch to select a competition leads to a screen with round information, match history, table, and top scorers. The team interface allows you to adjust your notifications with taps on the screen. This is a handy feature, so you can elect to receive lots of updates or just a few. The team interface also provides you with the match history, stats, squad information, and tables. You can also tap on a squad member to learn more about him or her. The media information includes some video commentary, but I still feel you will want to get in-depth commentary through other providers. A concern about the accuracy of the content did surface. Moyes is still listed as Manchester United’s manager, but he was sacked a week ago. I am, perhaps, picky in this instance since managers are frequently fired and replaced. The Forza Football iPhone, iPod Touch, and iPad app is supported by an ad at the bottom of the screen, but a $3.99 in-app purchase removes ads for around 6 months. This is a moderate charge, as it is much more smooth and agile than most of its competitors. AppSafari review of Forza Football (formerly Live Score Addicts) was written by Jenni Ward on April 29th, 2014 and categorized under App Store, Free, iPad apps, Productivity, Sports, Universal. Page viewed 13195 times, 6 so far today. Need help on using these apps? Please read the Help Page. I love football. I will try this app! 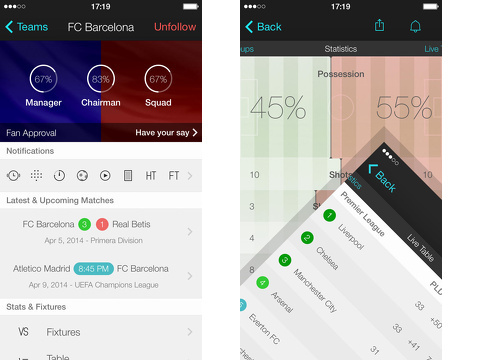 For those who like a lot of football is a great app.I personally really like the interface and design.Very good app. for those who love football, can be cool. I would say it´s worth to download this app. Thanks for the post, I was looking for this information and found here on their website. I also found it very cool application of ios. So far the ones who are using it have enjoyed the app. Thanks for sharing this great content, this is very good, congratulations! I will return again on this blog.